Potatoes are the edible, starchy tubers of Solanum tuberosum, a plant species of the nightshade family Solanaceae. They are widely cultivated all over the world, due to their nutritional value and incredible culinary versatility. But potatoes have curative and cosmetic properties as well, so they can be used to treat a wide variety of both medical and aesthetic conditions. 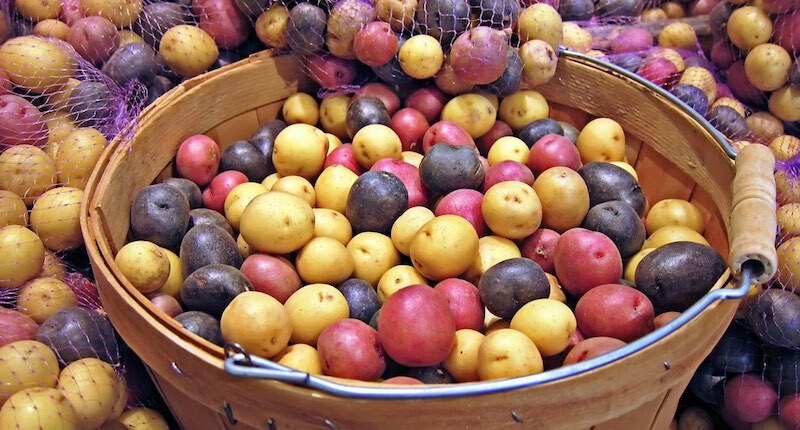 Potatoes come in many different sizes, colors and textures depending on the variety. The larger sizes are mature potatoes, while the smaller ones are new potatoes. The thin skin can be yellow, brown or reddish in color, while the starchy flesh is usually white or yellow and its texture can vary from waxy to floury. The texture affects how potatoes are best cooked. Although we don’t eat potato in its raw form, it can be used for juicing and is beneficial for many ailments. Potatoes are composed mainly of starch, a complex carbohydrate, and are virtually fat and cholesterol-free. 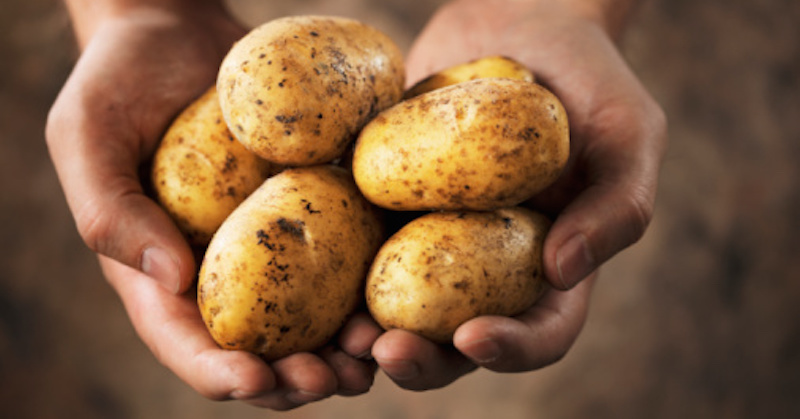 They also contain good amounts of beta-carotene, vitamin A, C, vitamins of the B complex (B1, B2, B6, and folate), potassium, calcium, iron, magnesium, phosphorus, sulphur and copper, as well as small amounts of fiber and protein (about 2.5 grams in a medium-sized potato). Since most of the nutrients are contained in or just under the skin, it is important not to peel potatoes when juicing them. New potatoes are especially rich with all these nutrients. Anemia: Potatoes are excellent sources of both iron and folate, which are essential for the production of red blood cells. For this reason potatoes can be used as a natural aid in the prevention or treatment of different forms of anemia. 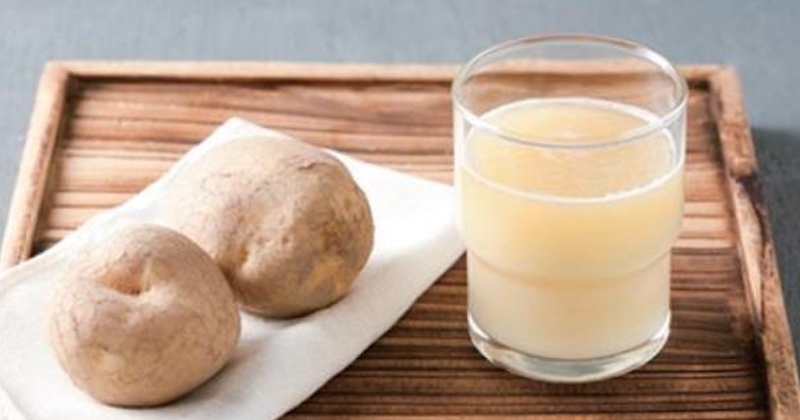 Gastritis and gastric ulcers: Perhaps the most common use of raw potato juice is to treat gastritis, colitis, gastric and intestinal ulcers, due to its gastro-healing properties. See below for the juice recipe. DO NOT drink water with a meal to prevent dilution of digestive enzymes and stomach acid. Eat a bowl of cooked oats daily for breakfast. Include plenty of fresh fruits and vegetables into your diet. This juice combo has been reported to provide relief for individuals suffering from gastritis. Drink once or twice a day, at least half an hour before a meal. Makes one serving, multiply quantities accordingly. Wash all the ingredients under running water. Do not peel, cut them up into sizes that will fit through your juicer chute. Juice and serve. When choosing potatoes, avoid those that have sprouted or those with a “green tint”. (See Cautionary Note below). Instead, choose new potatoes (smaller ones) which are harvested before they are fully mature. They contain the most nutrients. Store potatoes in cool (not cold), dark and dry places to avoid premature sprouting and dehydration. Also avoid storing in the refrigerator as this will cause the starch content to turn into undesirable sugar. Finally, avoid storing potatoes with onions. Each emit gases that are not conducive and will degrade each other. Check your potatoes regularly and remove those that have sprouted, spoiled and dried up so that they don’t affect the other good potatoes. Potatoes are among the foods which pesticide residues are frequently found. Go for organic whenever possible. If not, soak them in water with apple cider vinegar and sea salt to remove the residues. Then use a vegetable brush to give a good scrub on the peel before using. 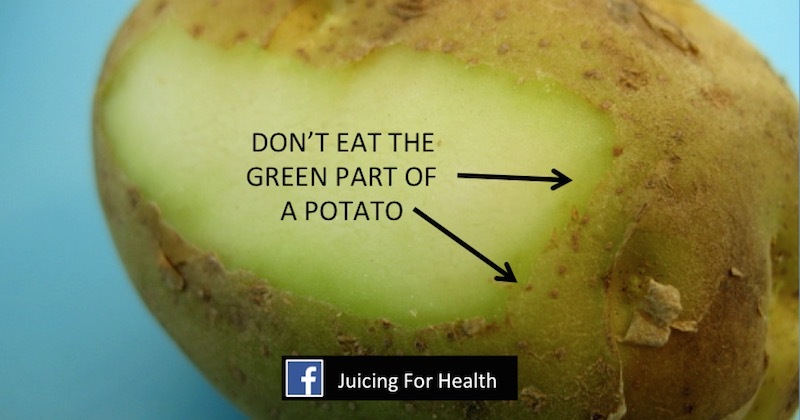 Avoid consuming potatoes that have sprouted, turned green or have dehydrated. These contain toxic alkaloid solanine that have undesirable taste and may cause circulatory and respiratory health symptoms like nausea, diarrhea, stomach cramps, headache, dizziness. I have been taking my potato juice for a month now. It has really helped me with my skin problem. I had terrible spots in my legs. Now they are all gone. ?